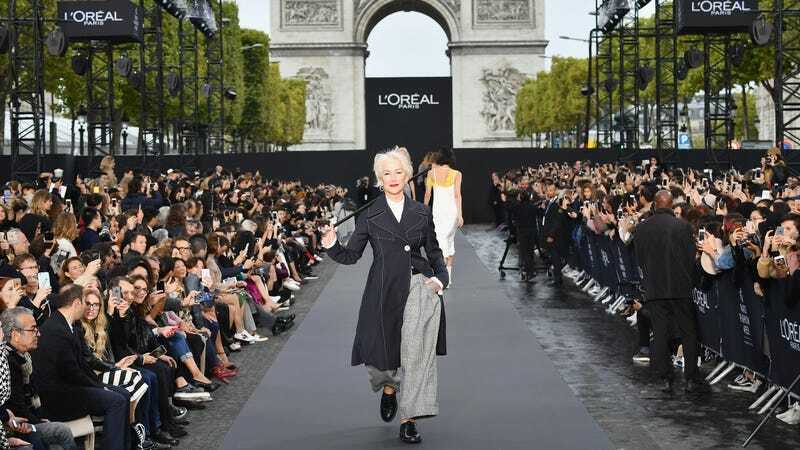 Here is some proof that women needn’t necessarily pack themselves with mothballs after the age of 35: Dame Helen Mirren and Jane Fonda, 72 and 79 respectively, totally murdered Paris Fashion Week walking for L’Oréal Paris on Sunday. Mirren sauntered down the runway in wide-leg grey trousers and a button down coat to the Chainsmokers’ “Paris,” jauntily swinging a cane which she’d occasionally use to gesture at a lucky audience member. Fonda, for her part, wore a flattering tiger-print gown from Balmain, flashing peace signs as she strutted. According to People, Fonda has worked with L’Oréal since September of 2014, with Mirren joining in October. “I am not gorgeous and I never was, but I was always OK looking and I’m keen to stay that way,” Mirren told The Daily Mail, wrongly, in the course of announcing the partnership. Fonda, for her part, seems to have recovered from her terrible encounter with Megyn Kelly, so good for her.